I planted 9 different varieties last year. Including Crystal Inspiration a large beautiful hot great storage or eating variety that we have planted here since 1998. All our garlic is grown in raised beds using hand tools and manual labor. No chemical fertilizers or pesticides are used. Soil fertility is created by sound animal rotations, feeding the soil food web with organic matter and inoculating it with biodynamic compost. Feel free to call, email or stop by and see what I have . Garlic is best shipped in the fall. Quantities are limited, order before September 30th for best availability. We can ship within the continental US. This is a mix of great garlic that is not fit for long term storage because of loose cloves or small blemishes, so it is perfect for all your fall food preservation projects. Kim chi, pickles, dilly beans, pesto, and pasta sauce. Limited availability $8 a lb. with quantity discounts. Garlics Natural Pharmaceutical Treasure Chest Known for 3500 years around the world for its healing as well as preventative properties, garlic is today being rediscovered by scientists; at last count, researchers have found that garlic contains over 400 different health-enhancing chemical components and compounds, a veritable all-natural pharmaceutical treasure chest. The breakdown of allicin in garlic releases the majority of the many chemical components of garlic, particularly by crushing or chewing raw garlic. Powerful sulfur compounds in garlic kill and inhibit an astounding assortment of bacteria, viruses, fungi, mold, parasites and worms, frequently on contact. They also work within the bodies vital systems, such as the circulatory, digestive, immunological, to promote detoxification, cleansing, lowering blood pressure, strengthening the immune system and healing. All in all, garlic helps promote good health. Mid-season. A vivid, royal purple tinged with shiny gold and or silver hues makes this one of the most attractive garlics. As a sub-variety of Purple Stripe, a group known for being the “best baked garlic”, Purple Glazer has a strong lasting flavor, but not hot and no aftertaste. Very easy to peel. Purple Glazer is listed in the Seeds of Diversity Canada catalogue of heritage varieties as endangered and hard to find. From Inchelium, WA, on the Colville Indian Reservation. The bulbs are large – to 3+ inches in diameter. 8-20 cloves of good size. Mild, but lasting, flavor, with a hint of hot! Dense cloves store well. Flavor can get stronger in storage. This vigorous soft-necked variety won a Rodale taste test of 20 garlic strains – named ” Very Best of the Soft-Necks.” Inchileum, is a soft neck so the cloves are smaller and have multiple layers of cloves. There are about 8 heads per pound and 8 to 10 large cloves per head with several smaller cloves in the center of the head that I don’t usually plant, I just eat the small ones. $18 a pound. Is one of the garlics from the Republic of Georgia in the former USSR. Chesnok is a standard Purple Stripe and has the typical heavy purple striping that gives this variety its name. 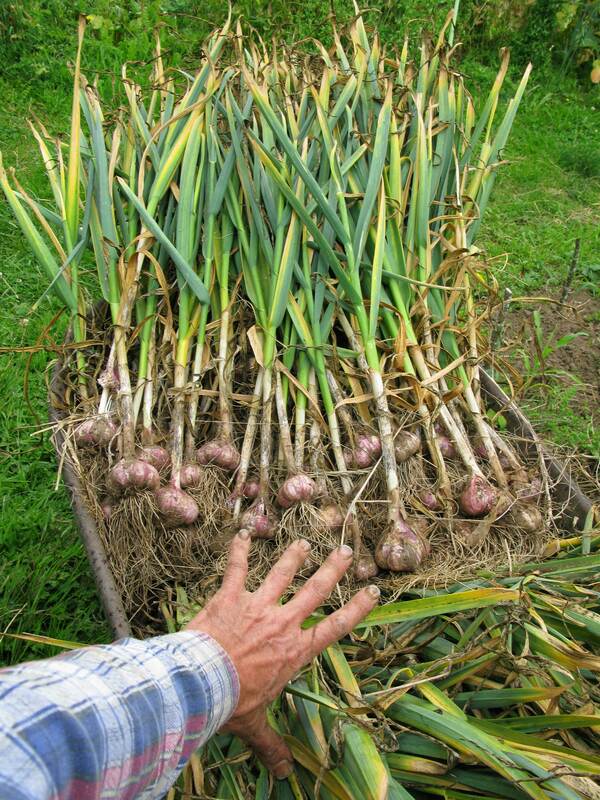 Chesnok Red can become a rather large garlic with excellent growing conditions. Large bulbs will have about 8 to 10 cloves arranged in a circular pattern. Cloves are easy to peel. It is a full flavored garlic with a mellow aftertaste that sticks around nicely for a while. The sweetest roasting garlic of them all; It doesn’t just taste not garlicky, it actually tastes sweet. Chesnok has about 4 -5 heads to the pound average. $18 a pound, limited amounts. Call 360-319-2029 to place your order.